A macrophage signature with higher IRF8 expression compared with lower IRF8 expression is associated with increased survival in patients with breast cancer, melanoma, and lung cancer. 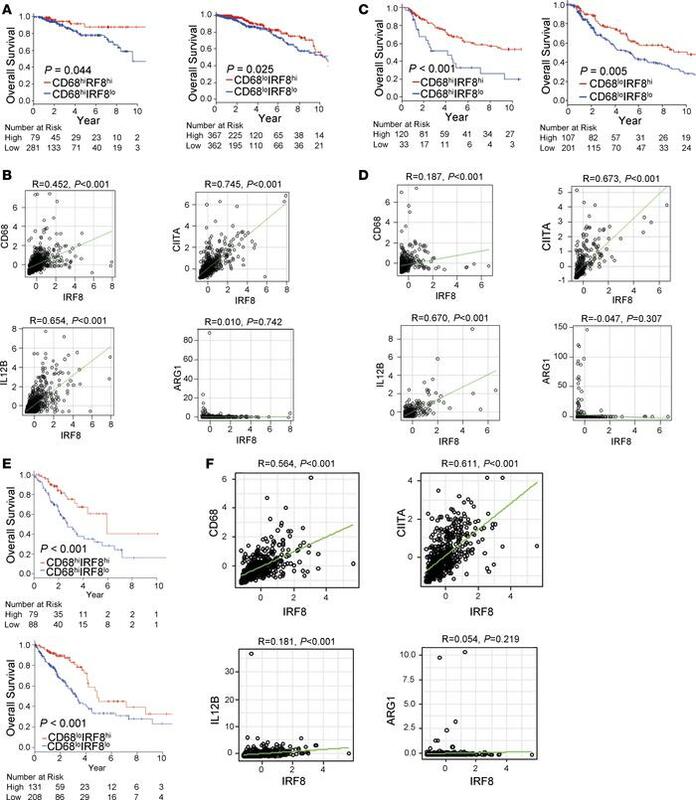 (A) Kaplan-Meier survival curves based on TCGA data showing an association of higher IRF8 expression in breast cancer patient tumors with CD68+ macrophages (high [n = 360; left panel] or low [n = 729; right panel] macrophage infiltration) correlates with improved overall survival in breast cancer. (B) Positive correlation between IRF8 and CD68, CIITA, or IL12B and a negative (or no) correlation with ARG1 in breast cancer, as determined by Pearson correlation. (C) Kaplan-Meier survival curves in melanoma patients based on TCGA data, as in A (high [n = 153; left panel] or low [n = 308; right panel] macrophage infiltration). (D) Correlation plots as in B. (E) Kaplan-Meier survival curves in lung cancer patients based on TCGA data, as in A (high [n = 167; top panel] or low [n = 339; bottom panel] macrophage infiltration). (F) Correlation plots as in B. Statistical analysis of the survival curves was determined by the Log-rank test.